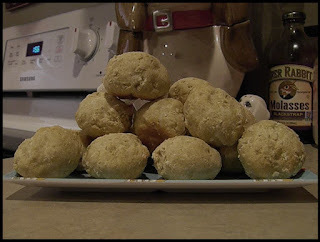 For Lobo's Gotcha Day yesterday, I threw together a simple homemade meatball dog treat. The inspiration behind that was the Bodacious Turkey Veggie Meatball Dog Treats that I created a couple of years ago. That recipe has lots of good stuff in it including carrots, apple, sweet potato, and cheese. I also included a grain free version. I've been wanting to create more meatball style dog treats including a simple recipe for the pups who have sensitive stomachs. Or, for the pet parents who have multiple dogs with various dietary restrictions. All of our kids eat homemade meals and snacks ranging from lean meats to fresh and cooked fruits and vegetables. However, with some foods, we have to be careful. For example, and as I explained in yesterday's blog column, Coco and Sophie can eat unlimited amounts of raw carrots, but we have to limit how many we give Lobo and Willa. If they eat too many, their BM's get runny. Willa can't have dairy or cucumbers. Sophie can't have blueberries even though she loves them. Coco doesn't digest rice too well so we don't give it to him. With that in mind, making a single batch of Bodacious Turkey Veggie Meatball Dog Treats isn't ideal for all of our kids. I decided to create a 3 ingredient simple meatball dog treat that all of our kids could eat. In the weeks ahead, I'll be creating more. Yesterday I needed something quick because of all the prep work for Lobo's Gotcha Day Celebration. Unfortunately, I had a dork moment when throwing together this recipe. I forgot to take photos. But, the recipe is super simple. I used my hands to mix the 3 ingredients. This mixture is very sticky to work with. Once mixed, roll into balls about the size of a golf ball. I baked these meaty gems at 350 for about 25 minutes. Your time may vary based on your oven. The finished product will be a little golden brown on the bottom. When they're cooled, you can store them in an airtight container or Zip Lock style bag. These treats need to be refrigerated. And, because they're made with meat, whatever you won't use within a few days should be put in the freezer. Our kids LOVED these meatballs.